Here’s a delicious summer dessert. Is it as good as the pies you can find in Key West? No. But it was a hit at Jellopalooza 2, scoring 3.7 on a scale of 1-5. 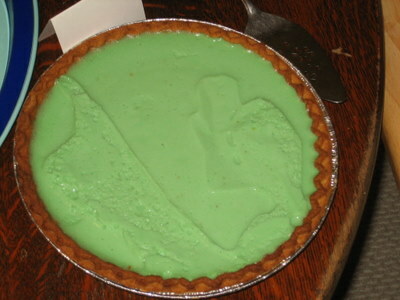 The jello gives the pie a smooth consistency, and the condensed milk cuts the tartness with some sweetness. It didn’t turn out too pretty because I had covered it with foil while it chilled, and some of the pie ended up sticking to the foil. Dissolve gelatin in boiling water. Add lime rind and juice. Pour slowly into beaten egg yolk, stirring constantly. Add condensed milk and bitters. Chill until slightly thickened. Beat egg white until stiff peaks form. Fold into gelatin mixture. Add food coloring. Pour into pie shell. Chill until firm – about 3 hours. Garnish with lime slices or Cool Whip, if desired. This was the favorite dish of the party for 1-year-old Blake. 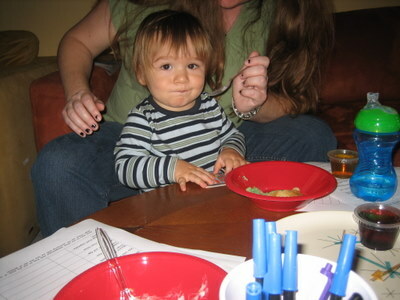 Check out his cute lil’ puckered face as he enjoys the Key Lime Pie. 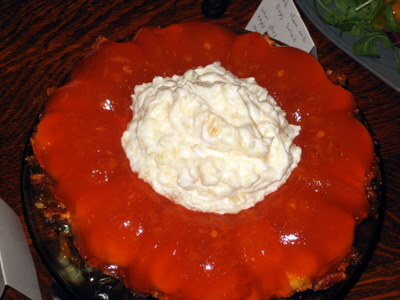 This was my first time using bitters in a jello recipe, but it seems that bitters are a common ingredient of Caribbean recipes like Key Lime Pie. I had previously only associated bitters with cocktails. Hmm, maybe I should mix some bitters into my next batch of jello shots. Here’s Jimmy Buffett’s recipe for Key Lime Pie (sans bitters). Hmm, did 70’s parents think their kids might be more willing to eat fresh veggies if the veggies were encased in jello? If so, I think they were wrong. This was a foul concoction. It has the distinction of earning the lowest score at Jellopalooza 2: 1.4 out of 5. Yes, even Molded Ham and Egg Salad did better at 1.5. I guess as a consolation, I can point out the dish is mostly healthy, if you overlook the sugary jello component. I took lemon jello, added bouillon, vinegar, salt and pepper, and sour cream. The vegetables in the mold were celery, radishes, cucumber, scallions, and green pepper strips. The jello mold had a sickly cream color, probably due to the sour cream. It looks deceptively like pudding. Per the book’s suggestion, I garnished with lettuce. I did not serve it with French dressing – another suggestion of the book. It seems odd to me to put salad dressing on top of jello. And French dressing could not have saved this dish. My guests were united in revulsion. Maybe I was too heavy-handed with the salt, but I don’t really think anything could save this jello mold. A plain old salad may be dull, but it’s definitely preferable to salad vegetables in jello. If you wonder why my progress on getting through this cookbook is slow, it’s due to recipes like this one. 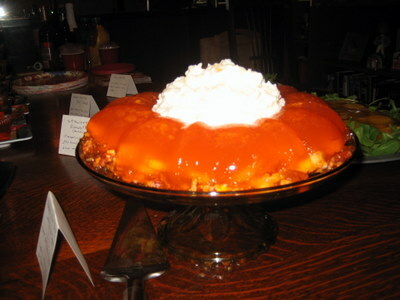 Here’s another winner from the “Centerpiece Desserts” chapter – a jello mold fit for a Cardinal! And this one actually required some investigative reporting. 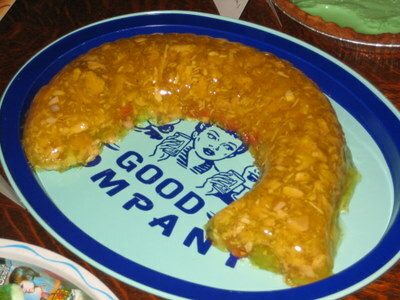 There’s a whole lot of flavor and richness in this jello mold, plus it was simple to make. Drain cherries and reserve 3/4 cup of the syrup. Dissolve gelatin in boiling water. Add reserved syrup and orange juice. Chill until thickened. Fold in cherries and oranges. Pour into a 4 cup mold or individual molds. Child until firm – 4 hours or overnight. Combine whipped topping and toasted almonds. Unmold gelatin. Serve with topping. Makes 3 1/2 cups or 6 servings. My jello-fan-friend Christopher thought this one was especially good, and Dave enjoyed it too. I liked it too. I used strawberry jello. I think raspberry would have maybe added even more kick. Cherry jello would seem redundant. The Cool Whip and almonds made a tasty garnish and cut some of the richness of the dark cherries. I wasn’t really sure what the name meant. 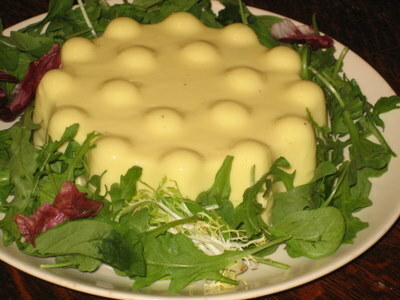 I googled for other recipes involving the name Richelieu, and there’s a wide variety, but I couldn’t find anything in common with this jello mold. 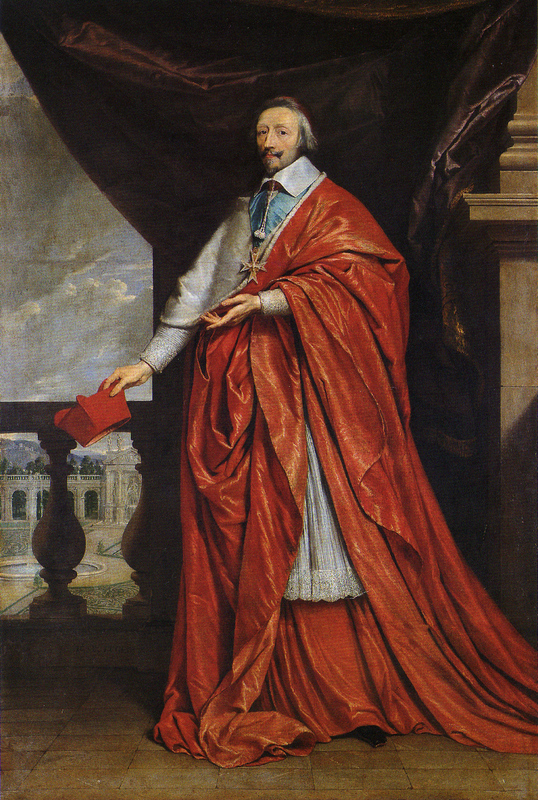 I guessed it was named for Cardinal Richelieu, a French nobleman of the 17th Century, thought of as a the first prime minister (and also a character in The Three Musketeers). Richelieu was a lover of the arts, culture, and fine cuisine and is credited with introducing the eggplant to French cuisine. Thank goodness there is no eggplant in this jello mold. The Cardinal seems to have lived very large. On drinking, he said, “If God forbade drinking, would He have made wine so good?” So I figured maybe the cookbook writer thought this decadent jello mold suited the Cardinal, plus it’s red like his robes. Call me Columbo. I don’t give up easily, and the Cardinal Richelieu connection to jello seemed tenuous at best. Everyone knows jello is more associated with Mormons than Catholics. Further investigation revealed a very simple answer. There’s a company named Richelieu Foods. One of their products is canned cherries. You can even buy the Richelieu brand cherries on Amazon. Sigh…oh well, at least I learned some stuff about Cardinal Richelieu. Here’s another hit from the “Centerpiece Desserts” chapter of the book: Banana Nut Ring with Ginger Topping. While the recipe name doesn’t really roll off the tongue, the dessert itself is delightful. This was the highest-scoring dish at Jellopalooza 2, netting a 4.3 on a scale of 1-5. So, here’s the recipe. Dissolve gelatin in boiling water. Drain pineapple, measuring syrup. Add water to syrup to make 1 3/4 cups; add to gelatin. Chill until thickened. Fold in pecans and bananas. Spoon into a 6-cup mold. Chill until firm – about 4 hours. Meanwhile, prepare whipped topping mix as directed on package; fold in drained pineapple and ginger. Chill. Unmold gelatin and spoon whipped topping mixture into center of ring mold. Garnish with pecan halves and additional ginger, if desired. Makes 10 servings. I’m not a big fan of ginger, but it made a nice accent to this dish and went well with the orange jello and the pineapple. I was worried the bananas would seem soggy, but they didn’t. The dish combines some of my favorite fruit flavors, and the Dream Whip topping makes it extra fun. Use a bundt pan as a mold and present it on a cake stand for a standout “Centerpiece Dessert” at your next soiree. 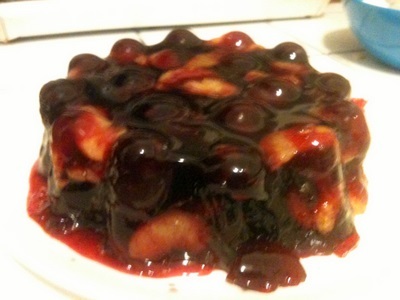 Here’s another recipe I made for Jellopalooza 2 that I have put off writing about since it was foul. My last attempt at merging fish and Jello – Salmon Dill Mousse – was so harrowing that I had to take several weeks off from the jello mission. I still have nightmares involving canned salmon. Spanish Tuna Salad wasn’t as terrible, but it certainly wasn’t tasty, either. What exactly is Spanish about it? I have no idea. The recipe involves lemon jello, vinegar, salt, pepper, tomato, cucumber, celery, onions and tuna. I made it in my fish mold. The recipe recommends garnishing with mayonnaise. Mayo and tuna, I understand. But mayo and tuna and jello? I disregarded this advice. The dish scored a 1.9 on a scale of 1-5. For some reason, the authors of The New Joy of Jell-O felt this recipe was worthy of a 2-page photo spread. 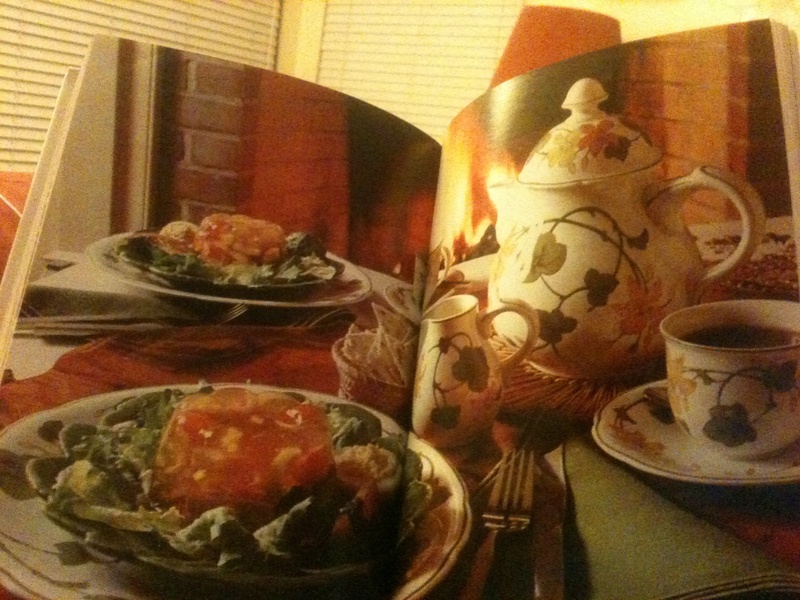 Even the pretty china place settings and teapot, and the cozy fireplace in the background cannot make this dish look appetizing. It’s like putting lipstick on a pig. Or putting mayo on tuna jello. 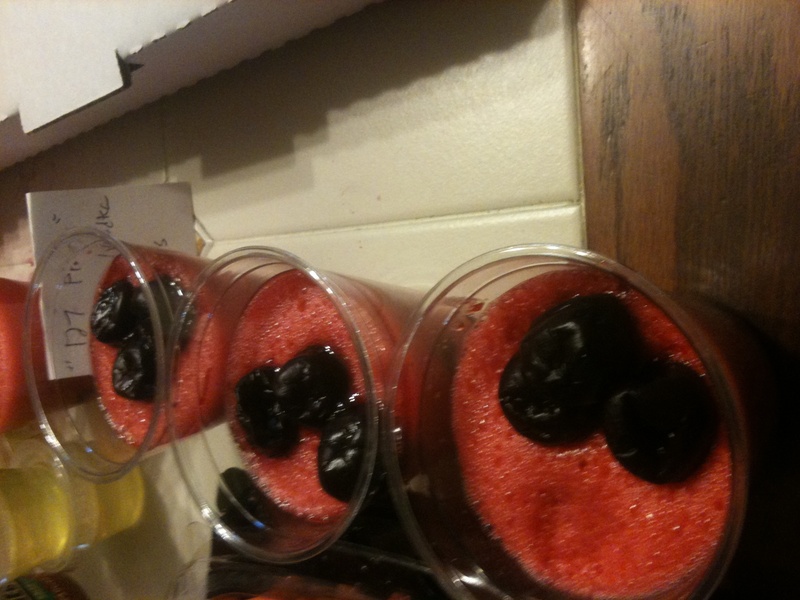 In search of more theme recipes for the Oscars, I made Ported Cherry Dessert in honor of The King’s Speech. I don’t know if they actually drink port in the movie, but it seems like they would. With enough port, one goes from stuttering to slurring, right? This one turned out very tasty. My friend Christopher described it as “a party in a cup.” So here’s the recipe. Drain cherries, measuring syrup. Reserve 6 cherries for garnish. Add lemon juice to syrup and wine to make 1 cup and bring to a boil. Combine gelatin and boiling liquid in a blender. Cover and blend at low speed for 30 seconds or until gelatin is dissolved. Add crushed ice and blend at high speed until ice is melted – about 30 seconds. Pour into individual dishes or wine glasses. Add cherries. Garnish with sour cream and reserved cherries. Chill. Makes about 4 cups or 6-8 servings. This was super-quick to prepare, since the ice makes the jello set immediately. I guess blending it gave the jello a fizzy appearance. I didn’t garnish it with sour cream, and I poured it into plastic wine cups since I didn’t have enough martini glasses. 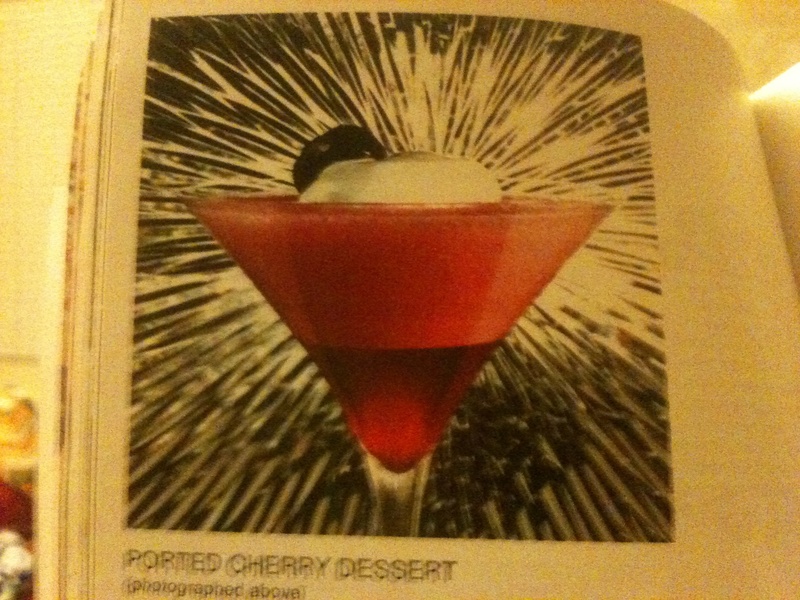 It certainly looks much classier in the martini glasses, as depicted in the exciting illustration from the cookbook. It seems to be exploding with flavor! Not having really paid attention to the recipe when shopping, I didn’t realize the recipe was only going to make 7 servings. I thought I might need a little more for the Oscars gathering, but the only red jello I had in the kitchen cabinet was sugarfree raspberry. Interestingly, the sugarfree jello did not work at all. It turned into a massive gelled blob in the blender. I had to toss it. Maybe a reader with a science degree can explain the reasons for that mishap. I used a very tasty port wine from Kalyra, my favorite central coast winery. The dessert was light and frothy, and the cherry and port flavors complemented each other well. I’d make this one again, perhaps even for royalty. Winter’s Bone Missouri Gooey Butter Cake – everyone flips out over this cake whenever I make it. Such a decadent delight. Mix jello with hot water until dissolved (about 2 mins). Add gatorade, stir. Let sit until steam dissipates. Add vodka and stir thoroughly (1-2 mins). Pour into jello shot containers and chill for 4 hours or until set. Makes 20 jello shots. If you can get over the associations from the movie, you’ll find it tastes refreshing. Some of our guests were grossed out, and some just don’t drink booze at all, so I had a bunch of shots leftover. Too bad, because I’m sure the show would have been more entertaining if we were drunk on jello. I don’t recommend these gatorade shots for use during your workouts, but if you’re stuck between a rock and a hard place, you could do a lot worse. It’s the stuff that hallucinations are made of.